Echoviruses (species Enterovirus B, genus Enterovirus, family Picornaviridae) are the most common cause of aseptic meningitis in children and adult patients usually occurring by epidemics during summer and autumn months in Western countries [1Vollbach S, Müller A, Drexler JF, et al. Prevalence, type and concentration of human enterovirus and parechovirus in cerebrospinal fluid samples of pediatric patients over a 10-year period: a retrospective study. Virol J 2015; 12: 199. [http://dx.doi.org/10.1186/s12985-015-0427-9] [PMID: 2660 7060] -5Chambon M, Archimbaud C, Bailly JL, et al. Circulation of enteroviruses and persistence of meningitis cases in the winter of 1999-2000. J Med Virol 2001; 65(2): 340-7. [http://dx.doi.org/10.1002/jmv.2039] [PMID: 11536242] ]. Even though there is no available specific antiviral treatment that could have a significant clinical impact on patients [6Abzug MJ, Cloud G, Bradley J, et al. Double blind placebo-controlled trial of pleconaril in infants with enterovirus meningitis. Pediatr Infect Dis J 2003; 22(4): 335-41. [http://dx.doi.org/10.1097/01.inf.0000059765.92623.70] [PMID: 1269 0273] ], overall prognosis of meningitis due to echoviruses is good [3Ramers C, Billman G, Hartin M, Ho S, Sawyer MH. Impact of a diagnostic cerebrospinal fluid enterovirus polymerase chain reaction test on patient management. JAMA 2000; 283(20): 2680-5. [http://dx.doi.org/10.1001/jama.283.20.2680] [PMID: 1081 9951] ]. However, aseptic meningitis cases due to echovirus are frequently hospitalized for a few days, the time required to rule out bacterial meningitis and to confirm enteroviral meningitis. Such hospitalization is expensive and numerous past studies have studied the impact of Enterovirus (EV) Real Time-Polymerase Chain Reaction (RT-PCR) assays that have definitively supplanted viral culture methods [7Archimbaud C, Chambon M, Bailly JL, et al. Impact of rapid enterovirus molecular diagnosis on the management of infants, children, and adults with aseptic meningitis. J Med Virol 2009; 81(1): 42-8. [http://dx.doi.org/10.1002/jmv.21330] [PMID: 19031461] ] on hospitalization length. In house, daily testing protocols as well as fully automated assays allowing point of care testing have been associated with shorter hospitalization length than send out, three times a week and conventional PCRs assays with manual extraction step [8Lyons TW, McAdam AJ, Cohn KA, Monuteaux MC, Nigrovic LE. Impact of in-hospital enteroviral polymerase chain reaction testing on the clinical management of children with meningitis. J Hosp Med 2012; 7(7): 517-20. [http://dx.doi.org/10.1002/jhm.1947] [PMID: 22592976] -10Giulieri SG, Chapuis-Taillard C, Manuel O, et al. Rapid detection of enterovirus in cerebrospinal fluid by a fully-automated PCR assay is associated with improved management of aseptic meningitis in adult patients. J Clin Virol 2015; 62: 58-62. [http://dx.doi.org/10.1016/j.jcv.2014.11.001] [PMID: 25542472] ]. Retrospective analysis of medical records also suggested that echovirus meningitis cases with EV RT-PCR results released within 24 hours tend to have a shorter hospitalization length than cases with EV RT-PCR results available in more than 24 hours [7Archimbaud C, Chambon M, Bailly JL, et al. Impact of rapid enterovirus molecular diagnosis on the management of infants, children, and adults with aseptic meningitis. J Med Virol 2009; 81(1): 42-8. [http://dx.doi.org/10.1002/jmv.21330] [PMID: 19031461] , 11Robinson CC, Willis M, Meagher A, Gieseker KE, Rotbart H, Glodé MP. Impact of rapid polymerase chain reaction results on management of pediatric patients with enteroviral meningitis. Pediatr Infect Dis J 2002; 21(4): 283-6. [http://dx.doi.org/10.1097/00006454-200204000-00005] [PMID: 120 75757] ], but the benefit of early RT-PCR reports is not so obvious during EV meningitis outbreaks [4Stonehouse V, Furyk J, Norton R. Impact of polymerase chain reaction results on patient management during a viral meningitis outbreak in Tropical North Queensland. Emerg Med Australas 2012; 24(1): 52-6. [http://dx.doi.org/10.1111/j.1742-6723.2011.01483.x] [PMID: 2231 3560] , 12Tattevin P, Minjolle S, Arvieux C, et al. Benefits of management strategy adjustments during an outbreak of enterovirus meningitis in adults. Scand J Infect Dis 2002; 34(5): 359-61. [http://dx.doi.org/10.1080/00365540110080557] [PMID: 12069020] ]. Indeed during outbreaks, patients are often discharged before RT-PCR results in case of apparently negative bacterial culture of the cerebrospinal fluid [12Tattevin P, Minjolle S, Arvieux C, et al. Benefits of management strategy adjustments during an outbreak of enterovirus meningitis in adults. Scand J Infect Dis 2002; 34(5): 359-61. [http://dx.doi.org/10.1080/00365540110080557] [PMID: 12069020] ]. Conversely, the occurrence of postlumbar puncture intracranial hypotension could be associated with prolonged hospitalization length [13Roos C, Concescu D, Appa Plaza P, Rossignol M, Valade D, Ducros A. Post-dural (post-lumbar) puncture syndrome. Review and retrospective study at an emergency headache centre. Rev Neurol (Paris) 2014; 170(6-7): 407-15. [http://dx.doi.org/10.1016/j.neurol.2014.02.004] [PMID: 24726041] ] despite early RT-PCR results. In France, in 2014, the number of cases of Enterovirus infections (mainly aseptic meningitis) during autumn was unusually high compared to those of previous or following years (Fig. 1A ). In Reims University Hospital, the number of cases of aseptic meningitis with positive EV RT-PCR assay during the last trimester 2014 was also higher than those observed in the last trimester 2013 (see the results section). During the last trimester 2014, diagnostic and therapeutic strategies in Reims University Hospital remained unchanged: in house EV RT-PCR assay was performed three times a week (Monday, Wednesday, Friday) in Virology Laboratory using the commercially available Enterovirus R-gene kit (Biomérieux®, Varhiles, France) and treatment prescription remained at patient’s physician discretion. CSF samples of included patients were extracted using QIA amp® Viral RNA Mini-Kit. Viral protein 1 (VP1) and 3D Polymerase (3D-Pol) gene regions were then amplified, as described by Nix et al. [14Nix WA, Oberste MS, Pallansch MA. Sensitive, seminested PCR amplification of VP1 sequences for direct identification of all enterovirus serotypes from original clinical specimens. J Clin Microbiol 2006; 44(8): 2698-704. [http://dx.doi.org/10.1128/JCM.00542-06] [PMID: 16891480] ] and Lukashev et al. 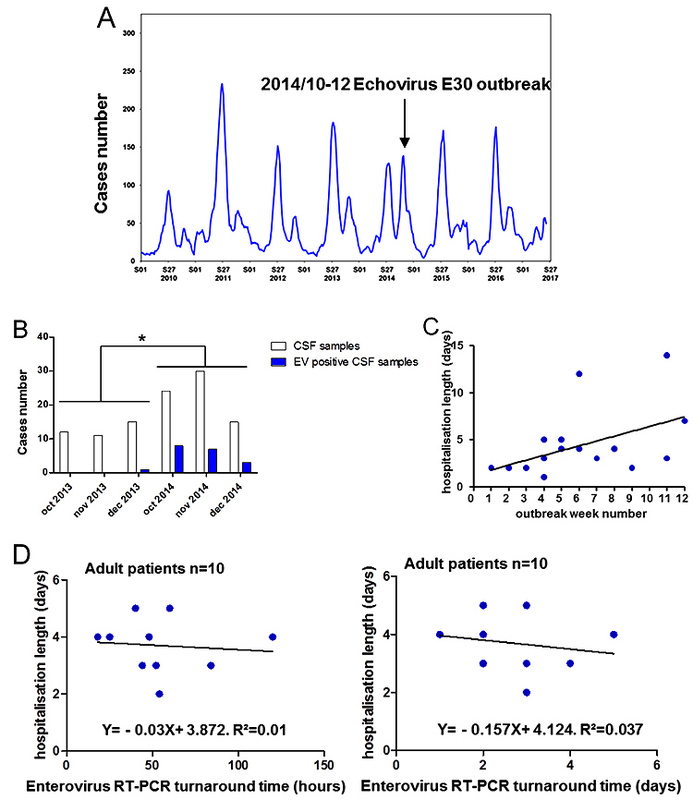 [15Lukashev AN, Lashkevich VA, Ivanova OE, Koroleva GA, Hinkkanen AE, Ilonen J. Recombination in circulating enteroviruses. J Virol 2003; 77(19): 10423-31. [http://dx.doi.org/10.1128/JVI.77.19.10423-10431.2003] [PMID: 129 70427] ] respectively. Amplicons were purified using Purelink Quickgel extraction kit according to manu-facturer’s instructions (ThermoFischer scientific®, Illkirh, France) before a Sanger sequencing reaction was performed [16Lévêque N, Jacques J, Renois F, et al. Phylogenetic analysis of Echovirus 30 isolated during the 2005 outbreak in France reveals existence of multiple lineages and suggests frequent recombination events. J Clin Virol 2010; 48(2): 137-41. [http://dx.doi.org/10.1016/j.jcv.2010.03.011] [PMID: 2038 1415] ] (Genewiz®, Takeley Essex, United Kingdom). All available human echovirus E30 VP1 (n=13) and 3DPol (n=15) partial genomes were downloaded from Genbank (https://www.ncbi.nlm.nih.gov/gen bank/) on 2/25/18. Sequences were analyzed as de-scribed by Mc Intyre and colleagues [17McIntyre CL, Savolainen-Kopra C, Hovi T, Simmonds P. Recombination in the evolution of human rhinovirus genomes. Arch Virol 2013; 158(7): 1497-515. [http://dx.doi.org/10.1007/s00705-013-1634-6] [PMID: 2344 3931] ]. 2013. Briefly, regions with more than 90% coverage were analyzed between positions 2581- 2873 for VP1 and 5887-6461 for 3DPol (all numbering are reported following the reference strain Echovirus 30 strain Bastianni (accession number KY888275.1)). Sequence alignments were performed with Mega version 7.0 (Molecular Evolutionary Genetics Analysis) [18Kumar S, Stecher G, Tamura K. MEGA7: Molecular Evolutionary Genetics Analysis Version 7.0 for Bigger Datasets. Mol Biol Evol 2016; 33(7): 1870-4. [http://dx.doi.org/10.1093/molbev/msw054] [PMID: 2700 4904] ], using ClustalW algorithm and manual inspection of nucleotide alignments. Phylogenetic analysis was inferred by using the Maximum Likelihood method based on the Kimura 2-parameter model [19Kimura M. A simple method for estimating evolutionary rates of base substitutions through comparative studies of nucleotide sequences. J Mol Evol 1980; 16(2): 111-20. [http://dx.doi.org/10.1007/BF01731581] [PMID: 7463 489] ] and a bootstrap method of 1,000 iterations. Distribution of pairwise nucleotide p-distances was then calculated for individual regions. Echovirus 30 VP1 sequences are available under the GENBANK numbers: MH 307969- MH307975; Echovirus 30 3Dpol sequences are available under the Genbank numbers MH307962-MH307968. Eighteen out of 69 patients (26.1%) who had a lumbar puncture between October 1st 2014 and December 31st 2014 were “enterovirus positive” whereas only one of the 38 patients (2.6%) who had lumbar puncture between October 1st 2013 and December 31st 2013 was “enterovirus positive” (p=0.0024, according to Chi2 Pearson’s test) (Fig. 1B ). A) Number of cases per week of Enterovirus infections (mainly aseptic meningitis) according to Enterovirus Survey Network in France from January 1st 2010 to June 10th 2017 (data issued from http://invs.santepubliquefrance.fr/Dossiers-thematiques/ Maladies-infectieuses/Maladies-a-prevention-vaccinale/Poliomyelite/Points-de-situation/Point-sur-les-infections-a-enterovirus-au-20-juin-2017 , accessed on February 19th 2018.) Black arrow depicted number of cases corresponding to autumn 2014. B) Number of cases per month of Cerebrospinal Fluids (CSF) sampled and Enterovirus (EV) positive Cerebrospinal Fluids sampled in Reims University Hospital during the months of October (oct), November (nov) and December (dec) 2013 and 2014. * p<0.05. C) Correlation between hospitalization length (days) and outbreak length expressed as the number of weeks outbreak was pursuing. Outbreak week number 1 to 4 corresponded to the month of October 2014, 5 to 8 to the month of November 2014 and 9 to 12 to the month of December 2014. D) Correlation between hospitalization length (days) and Enterovirus real time polymerase chain reaction (EV RT-PCR) turnaround time in adult patients (n=10). Left, EV RT-PCR turnaround time expressed in hours, right, EV RT-PCR turnaround time expressed in calendar days. Although all of the 18 patient’s samples were tested, sequencing analysis data were available for 10 out of the 18 (55.6%) outbreak patients. Phylogenetic VP1 sequences analyses identified that the outbreak was related to an Echovirus 30 strain in 7 out of the cases (70%). The three re-maining sequences analyses evidenced Echovirus 14, 9 and 7 strains. Patients with sequencing analysis data available were not clinically different from those without sequencing analysis data available (not shown). The phylogenetic tree constructed using the VP1 sequences is depicted in Fig. (2A ). All of these strains belonged to the same cluster that was closer to strains circulating in France during 2008 and 2009 (nucleotide p-distance 0.024 to 0.046 and 0.038 to 0.065 respectively) than to strains circulating in France during 2011 or 2013 (nucleotide p-distance 0.041 to 0.072 and 0.045 to 0.078 respectively), strains circulating in Italy during 2014 (nucleotide p-distance 0.116 to 0.137) or Bastianni reference strain (nucleotide p-distance 0.202 to 0.209). Supplementary analysis of 3D-Pol viral gene region was performed in these 7 strains confirming the identification of an Echovirus 30 subtype and moreover suggesting the absence of large intra or inter-serotypic recombination events that could explain the occurrence of this autumnal outbreak (Fig. 2B ). The correlation between hospitalization length and outbreak length is depicted in Fig. (1C ). There was no clear trend to reduction of case’s hospitalization length as the outbreak continued. Conversely, hospitalization length was statistically shorter in October than in the two last months (2 days [1Vollbach S, Müller A, Drexler JF, et al. Prevalence, type and concentration of human enterovirus and parechovirus in cerebrospinal fluid samples of pediatric patients over a 10-year period: a retrospective study. Virol J 2015; 12: 199. [http://dx.doi.org/10.1186/s12985-015-0427-9] [PMID: 2660 7060] -5Chambon M, Archimbaud C, Bailly JL, et al. Circulation of enteroviruses and persistence of meningitis cases in the winter of 1999-2000. J Med Virol 2001; 65(2): 340-7. [http://dx.doi.org/10.1002/jmv.2039] [PMID: 11536242] ] versus 4 days [2Jarrin I, Sellier P, Lopes A, et al. Etiologies and management of aseptic meningitis in patients admitted to an internal medicine department. Medicine (Baltimore) 2016; 95(2): e2372. [http://dx.doi.org/10.1097/MD.0000000000002372] [PMID: 26765 411] -14Nix WA, Oberste MS, Pallansch MA. Sensitive, seminested PCR amplification of VP1 sequences for direct identification of all enterovirus serotypes from original clinical specimens. J Clin Microbiol 2006; 44(8): 2698-704. [http://dx.doi.org/10.1128/JCM.00542-06] [PMID: 16891480] ], p=0.02) because cases involving children without comorbidity were overrepresented in October compared to the two last months (5 out of 8 (62.5%) versus 0 out of 10 (0%), p= 0.006 according to Fischer’s exact test). The correlation between hospitalization length and EV RT-PCR turnaround time was poor (Y= - 0.34 X + 5.973; R2=0.06, Y= - 0.131X+ 9.09; R2=0.16, Y= - 0.03X+ 3.872; R2=0.01) among all outbreak patients (n=18), all children (n=8) and all adults (n=10) respectively. Because children without comorbidity were more frequently discharged before EV RT PCR results and because neonates and children with comorbidity remained in hospitalisation despite EV RT-PCR results released (Table 1), only the correlation between hospitalization length and EV RT-PCR turnaround time in adult patients (n=10) is depicted in Fig. (1D ). Even in the absence of postlumbar puncture intracranial hypotension in adult patients (Table 1), the correlation between hospitalization length and EV RT-PCR turnaround time was poor (R2= 0.01). The correlation was not better (R2 =0.03) when EV RT-PCR turnaround time was expressed in calendar days, considering that medical decision to discharge a patient from hospital was a sequential process during rounds and not a continuous process. 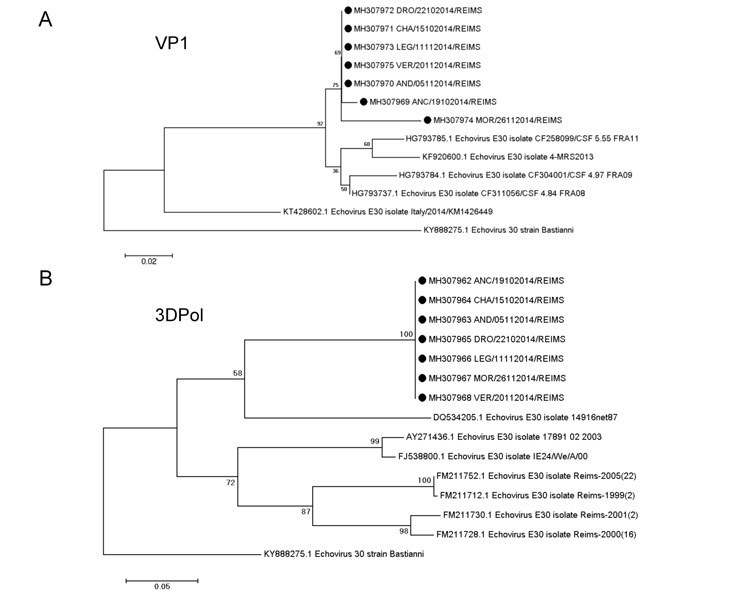 Phylogenetic trees comparing strains isolated during this outbreak (n=7 and identified as Echovirus 30 strains according to reference Viral protein 1 gene region sequencing analysis) with available sequences of Echovirus circulating in Europe. A) Viral protein 1 (VP1) gene region. Black dots: strains isolated during outbreak: MH 307969- MH307975. B) 3D Polymerase (3D-Pol) gene region. Black dots: strains isolated during outbreak. MH307962-MH307968. Clinicobiological data and outcome of outbreak patients. CRP: C reactive protein, CSF: Cerebrospinal Fluid. EV RT-PCR: Enterovirus Real-Time Polymerase Chain Reaction. * Fischer’s exact test. § Antibiotics (n=7), Aciclovir (n=2). Bold: significant differences. In the present study, our findings indicated that hospitalization length was poorly correlated to EV-RT PCR turnaround time during an Echovirus 30 aseptic meningitis outbreak occurring between October and December 2014. Short EV-RT PCR turnaround times were not systematically associated with short hospitalization lengths and significant discrepancies have been evidenced between children and adult patients, as previously described by Archimbaud and colleagues [7Archimbaud C, Chambon M, Bailly JL, et al. Impact of rapid enterovirus molecular diagnosis on the management of infants, children, and adults with aseptic meningitis. J Med Virol 2009; 81(1): 42-8. [http://dx.doi.org/10.1002/jmv.21330] [PMID: 19031461] ] in Clermont Ferrand reference centre during a whole year (summer outbreak and apart). Conversely, we focused this study only on an outbreak occurring during all autumn and the beginning of winter. Indeed, even if circulation of Enterovirus has already been reported during winter [5Chambon M, Archimbaud C, Bailly JL, et al. Circulation of enteroviruses and persistence of meningitis cases in the winter of 1999-2000. J Med Virol 2001; 65(2): 340-7. [http://dx.doi.org/10.1002/jmv.2039] [PMID: 11536242] ], we presumed such an unusual outbreak could have an impact of patient management because it could give to physicians the feeling of an ongoing outbreak earlier than during summer months. According to VP1 region sequencing analysis, this unusual outbreak was mainly related to Echovirus 30 that is the main strain involved in aseptic meningitis outbreaks in France [20Antona D, Lévêque N, Chomel JJ, Dubrou S, Lévy-Bruhl D, Lina B. Surveillance of enteroviruses in France, 2000-2004. Eur J Clin Microbiol Infect Dis 2007; 26(6): 403-12. [http://dx.doi.org/10.1007/s10096-007-0306-4] [PMID: 1753 4678] , 21Nougairede A, Bessaud M, Thiberville SD, et al. Widespread circulation of a new echovirus 30 variant causing aseptic meningitis and non-specific viral illness, South-East France, 2013. J Clin Virol 2014; 61(1): 118-24. [http://dx.doi.org/10.1016/j.jcv.2014.05.022] [PMID: 24973 284] ] and in Europe [1Vollbach S, Müller A, Drexler JF, et al. Prevalence, type and concentration of human enterovirus and parechovirus in cerebrospinal fluid samples of pediatric patients over a 10-year period: a retrospective study. Virol J 2015; 12: 199. [http://dx.doi.org/10.1186/s12985-015-0427-9] [PMID: 2660 7060] , 22Österback R, Kalliokoski T, Lähdesmäki T, Peltola V, Ruuskanen O, Waris M. Echovirus 30 meningitis epidemic followed by an outbreak-specific RT-qPCR. J Clin Virol 2015; 69: 7-11. [http://dx.doi.org/10.1016/j.jcv.2015.05.012] [PMID: 262093 68] ]. Supplementary sequencing of the 3D Pol did not support the hypothesis of an emerging new recombinant viral form [16Lévêque N, Jacques J, Renois F, et al. Phylogenetic analysis of Echovirus 30 isolated during the 2005 outbreak in France reveals existence of multiple lineages and suggests frequent recombination events. J Clin Virol 2010; 48(2): 137-41. [http://dx.doi.org/10.1016/j.jcv.2010.03.011] [PMID: 2038 1415] , 17McIntyre CL, Savolainen-Kopra C, Hovi T, Simmonds P. Recombination in the evolution of human rhinovirus genomes. Arch Virol 2013; 158(7): 1497-515. [http://dx.doi.org/10.1007/s00705-013-1634-6] [PMID: 2344 3931] ] but did not exclude the presence of intra or intertypic mosaic recombinant forms. According to VP1 region sequencing analysis, the 7 outbreak strains that were belonging here to the same cluster were closer to strains circulating in France during 2008 and 2009 than more recent strains circulating in France or Europe. Previous massive sequencing data evidenced that echovirus trans-portation was a major epidemiological factor in the appearance of epidemics [23Bailly JL, Mirand A, Henquell C, et al. Phylogeography of circulating populations of human echovirus 30 over 50 years: nucleotide polymorphism and signature of purifying selection in the VP1 capsid protein gene. Infect Genet Evol 2009; 9(4): 699-708. [http://dx.doi.org/10.1016/j.meegid.2008.04.009] [PMID: 18595781 ] ]. Taken together, these elements suggested that “older echovirus strains” could be recycled and gave onset to new out breaks after successive distant transportation. However, echovirus and EV phylogenetic evolution remained incompletely understood because of unsampled asymptomatic or paucisymptomatic infections. The inconstancy of clinical symptoms we reported here has also been evidenced in another recent French study [24Vareil M, Wille H, Kassab S, et al. Clinical and biological features of enteroviral meningitis among adults and children and factors associated with severity and length of stay. J Clin Virol 2018; 104: 56-60. [http://dx.doi.org/10.1016/j.jcv.2018.04.017] [PMID: 29738 895] ]. Concerning hospitalization length, two assertions can be made from our data. First, cases involving children of less than 15 years without comorbidity had a significantly shorter hospitalization length than adult or neonates and children with comorbidity. This assertion is fully in concordance with previous work from Archimbaud and colleagues [7Archimbaud C, Chambon M, Bailly JL, et al. Impact of rapid enterovirus molecular diagnosis on the management of infants, children, and adults with aseptic meningitis. J Med Virol 2009; 81(1): 42-8. [http://dx.doi.org/10.1002/jmv.21330] [PMID: 19031461] ], where children had also a significantly lower hospitalization length than adult or infants despite identical EV-RT PCR turnaround times. Interestingly, in this study where EV-RT PCR was performed daily from Monday to Friday [7Archimbaud C, Chambon M, Bailly JL, et al. Impact of rapid enterovirus molecular diagnosis on the management of infants, children, and adults with aseptic meningitis. J Med Virol 2009; 81(1): 42-8. [http://dx.doi.org/10.1002/jmv.21330] [PMID: 19031461] ], mean hospital-ization lengths of children and adults were very close to median hospitalization lengths of children and adults reported here where EV-RT PCR was performed three times a week: 1.9 versus 2 days for children and 4 versus 4 days for adults. In this study, this difference between children and adults was also related to the higher rates of discharge from hospital before EV RT-PCR results among children than among adults. Such a practice is probably related to the absence of differential diagnosis among children in case of aseptic meningitis [25Shukla B, Aguilera EA, Salazar L, Wootton SH, Kaewpoowat Q, Hasbun R. Aseptic meningitis in adults and children: Diagnostic and management challenges. J Clin Virol 2017; 94: 110-4. [http://dx.doi.org/10.1016/j.jcv.2017.07.016] [PMID: 28806 629] ], whereas aseptic meningitis due to others viruses or inflammatory diseases can occur in adult patients [2Jarrin I, Sellier P, Lopes A, et al. Etiologies and management of aseptic meningitis in patients admitted to an internal medicine department. Medicine (Baltimore) 2016; 95(2): e2372. [http://dx.doi.org/10.1097/MD.0000000000002372] [PMID: 26765 411] , 25Shukla B, Aguilera EA, Salazar L, Wootton SH, Kaewpoowat Q, Hasbun R. Aseptic meningitis in adults and children: Diagnostic and management challenges. J Clin Virol 2017; 94: 110-4. [http://dx.doi.org/10.1016/j.jcv.2017.07.016] [PMID: 28806 629] ]. This absence of differential diagnosis among children may strengthen the feeling of physician that early discharge of patient with symptomatic treatment will not be pejorative, once the estimation of the probability of Bacterial meningitis has been lowered by clinical examination data, Procalcitonin, Cerebrospinal Fluid lymphocytic predominance... The absence of reduction of hospitalization length as the outbreak was ongoing Fig. (1C ) suggested that the age and the absence of comorbidity reduced more the hospitalization length than a memorization bias of the physician about the presence of an ongoing outbreak. Secondly, during this outbreak without diagnostic and therapeutic strategies modifications, the cor-relation between hospitalization length and EV-RT PCR turnaround time was poor especially in adult patients even in the absence of postlumbar puncture intracranial hypotension (Table 1). This suggested that others subjective determinants of hospital discharge decision probably existed in case of aseptic meningitis (e.g. senior house officers’ apprehension to discharge patient from hospital...). Taken altogether, our findings suggested that (i) EV RT-PCR turnaround time was not correlated to hospitalization length during short outbreaks but only during longer periods [7Archimbaud C, Chambon M, Bailly JL, et al. Impact of rapid enterovirus molecular diagnosis on the management of infants, children, and adults with aseptic meningitis. J Med Virol 2009; 81(1): 42-8. [http://dx.doi.org/10.1002/jmv.21330] [PMID: 19031461] , 22Österback R, Kalliokoski T, Lähdesmäki T, Peltola V, Ruuskanen O, Waris M. Echovirus 30 meningitis epidemic followed by an outbreak-specific RT-qPCR. J Clin Virol 2015; 69: 7-11. 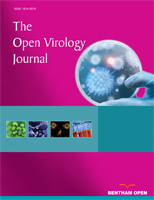 [http://dx.doi.org/10.1016/j.jcv.2015.05.012] [PMID: 262093 68] ] (ii) implementation of more expensive daily or Point of Care rapid EV RT-PCR or multiplex neurotropic viral assays only during short or unusual outbreaks could have limited impact onto a significant decrease of hospitalization length and costs.